Arguably the most radical of paradigm shifts in our view of the world over the past century, has been the insight that the universe – from the very small to the very large – can, in an uncannily effective way, be understood as a compound of waves, as a conglomerate of various vibrations. Sound, of course, we have always known to be vibrational in nature. Among the panoply of universal, concrete and abstract, waves and strings and things that, according to current understandings, concordate and discordate in composing our world’s myriad dimensions, it stands out because of its fundamentally material origin. In order for sound to be, some thing has to move. All that sounds, moves; all that moves, sounds. And sound, in a very literal sense, moves us. It is also over the past century that, hesitatingly at first, but eventually with near to brute force, the use of sound as a means for artistic expression and creation, broke loose from the confines imposed by the traditional collection of tools used to generate and control it (the ‘musical instruments’). Due to the explosive combination of technological developments, that enabled both the capturing (recording) and (re-)creation (synthesis) of whatever sound one could imagine, and the profound socio-cultural changes in the West in the decades following the Second World War, the idea that potentially any sound is a musical sound took firm hold on the music side. Meanwhile visual artists continued to free themselves from the laws, traditions, conventions, materials and techniques that for many centuries had defined art within the boundaries of a number of specialized crafts. They began to adopt any imaginable material and non-material as a means for expression, and put it to use around, in, up, under and at any imaginable place. Sound is surely the most notable among these materials, as well as the most ephemeral one.
. Sound wants to be free.
. Sound is a liberator. A lot has happened since. Many doors did open. Sound art – either the one, the other or the other – became the theme of several major museal exhibitions. And despite the fact that the majority of works labeled as such hardly count as ‘collectable’, thus remaining marginal from an art-economic point of view, shows labeled as ‘sound art’ increasingly can be found also in mainstream art galleries. A growing number of galleries and institutions has specialized in what nevertheless continues to be something of a ‘(non-)genre’. For this and coming generations of young, aspiring, artists, (some form of) sound art appears as a viable career choice, even though but a minority of the many artists currently active in ‘the field’ will openly refer to themselves as being just that: ‘sound artists’. Last but not least, something equally vague as ‘sound studies’, in one way or another, became part of the academic curriculum, and has been generating an ongoing stream of (some of them, some of them less) academic books, theses and publications, in which art historians, musicologists, as well as scholars from many another breed, attempt to tie down in learned classifications and – post/French/modern, or whatever – theory, a ‘discipline’ that is both between and transcending categories. The Ephemeral Sustainability conference in Bergen brought together a large, international, group of actors in this (wide and open) field: theorists, writers, artists, musicians, organizers, curators and students. Not so much to try, for an umpteenth time, to set boundaries to what Sound Art should be, and what it should not (though this is a theme that proves pretty hard to avoid), but first of all to discuss and present questions related to the presentation, the documentation and the conservation (the sustainability) of site specific art works that, in the majority of cases, are fundamentally ephemeral in nature. On the conference’s first day (moderated by German music critic and radio presenter Raoul Mörchen), the tone was set by German musicologist Helga de la Motte-Haber, an avid and longtime explorer of the phenomenon of sound art, and editor of Klangkunst: Tönende Objekte und klingende Räume, a (German) guide to the history, practice, and aesthetics of sound art, published in 1999. 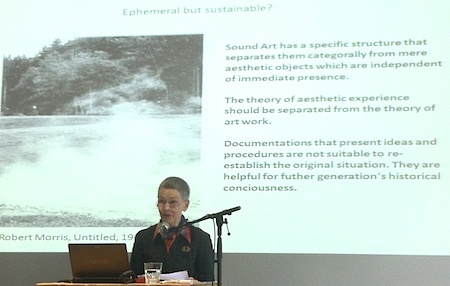 In her presentation (Situation Specific Sound Art – Ephemeral Works) she gave an overview of the emergence of a growing body of works of art that needed to be seen and heard, in the context of developments within the visual arts in the second half of the 20th century. There, ‘sound art’ is found to arise within, most notably, the fields of performance art and site specific art (land art), incorporating strong influences of abstract art, of minimal art, early experimental music and the Fluxus movement. Helga observed that, rather than deep involvement of a listener, sound art often primarily intends to reveal features of a space, by the setting up of conditions of perception. It subsequently led her to stress a situational aesthetics for sound installations, that in general can be experienced only for a – usually very – limited period of time, at a specific location. After that, what remains, if anything, is the documentation of the work: in the artist’s and or curator/organizer’s archives, in catalogues and in other documents, which, she insisted should – if possible – include architectural sketches. It was undoubtedly the musicologist in her that wondered why there is no notational system for ‘sound situations’, like a musical score. It would greatly facilitate the re-enactment of certain sound installations. But on the other hand, she asked, why should we try to preserve and maybe even re-enact works that, often quite intentionally, were limited to a certain time and a certain place? And yes, even more generally: must all art survive? 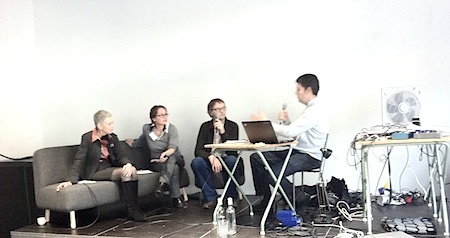 A bit later that morning, in the first of a series of panel discussions, moderator Raoul Mörchen asked the panelists to oppose the listening experience proper to ‘sound art’ to the ‘analytic, structural listening’ that we practice when listening to traditional (‘classical’) forms of Western music. Do we listen to music in a way that is different from the way in which we listen to sound art, or the sounds of everyday life? Though at first ‘sight’ this might seem to be almost trivially the case, it is an observation that on closer scrutiny quickly becomes problematic, something that was epitomized by Raoul’s own suggestion that “a Beethoven symphony in a toilet is the same as a Beethoven symphony in a concert hall”. What is most commonly put forward as a, be it rough and fluid, demarcation between ‘sound art’ and ‘music’, is that of sound developing in ‘space’ versus sound developing in ‘time’. This very first round of ‘ephemeral’ discussion provoked vehement reactions, on and off stage, from the not negligible part of participants who considered a strict, polarized, distinction between (listening to) sound art and (listening to) music to be a meaningless artefact. “It conveys a vision of music that is só very, very tiny,” David Toop, a British musician and prolific writer on music and sound, sighed. 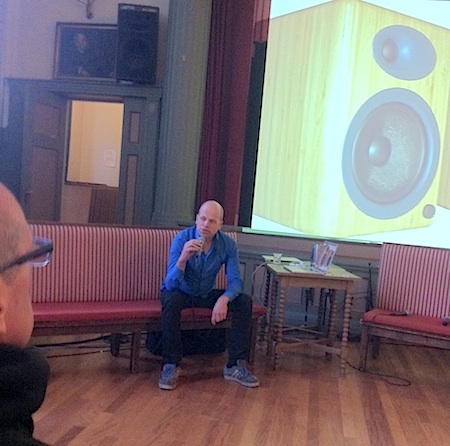 All sorts of ‘stuff with sound’ were brought to the fore (and could be listened to, though sparingly), in the series of artist’s presentations, that, like cherries on the cake, were programmed in between the ‘theory’. Also Norvegian artist Signe Lidén, in this new two year period, will make new work for the RESONANCE network. In her sound installations, Signe explained, she uses sound and space to examine social and cultural phenomena by means of an experiential form of research. Her presentation concentrated not so much on the creation of spaces, as on the finding of places as an essential part of her work. “I am searching and re-searching places and objects for their hidden sounds, often the inaudible ones or the potential ones.” Especially holes and cavities are places (or maybe we should call them: topologies) that fascinate Signe, exemplified by works like Rohrism I and Rohrism II, around and about the Gasometer Schöneberg in Berlin. It will have been a first time for some, but I found it a pity that, for significant parts, Dutch artist and researcher Edwin van der Heide‘s presentation, Sound in Space – Space in Sound, was a copy of the lecture he gave at the Budascoop in Kortrijk, as part of the Listen: Perspectives on Auditive Space symposium during the 2011 Flanders Festival. But, granted, at least Edwin is an entertaining lecturer, approaching his subjects (‘space’, ‘sound’, ‘loud/speaker’, ‘holes’ …) from a personal angle, with an interesting dose of, illustrative, metaphor. 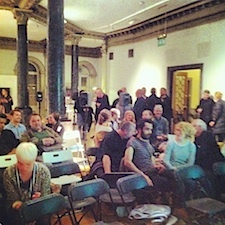 It was the very last lecture that, despite its little promising title (Installation Works in Public and Private Collections) turned out to be the conference’s opening day’s highlight. In her talk, German ‘first generation’ sound artist Christina Kubisch embarked upon what she, very appropriately, called an ‘archeology’ of her own work. She provided valuable insights in the very particular problems that as an artist she encounters with respect to the maintenance of many of her works. Mainly due to the media and the electronics that are necessary to keep them working (to ‘sustain’ them), these works often need continuous surveillance and adjustment. For the artist, from a distance, and especially when there is quite a few them, it is not really feasible (for practical, technical and also financial reasons) to keep track of this, while on the other hand, those that are – theoretically – responsible for the work’s well-being, often fail to do so. As a result, it does happen that over extended periods of time an installation piece gets ‘turned off’, or, because of modifications (accidental or on purpose) in its ‘technical tuning’, becomes a mere shadow of the work that the artist had intended it to be. As an example Christina discussed some of the recurring problems with respect to her permanent (since 2006) light-sound installation Licht Himmel in the Gasometer in Oberhausen, Germany. 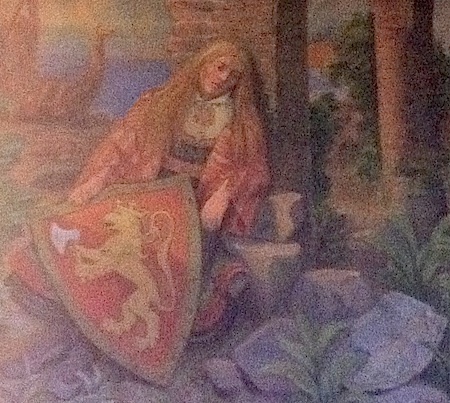 It had been a long day. 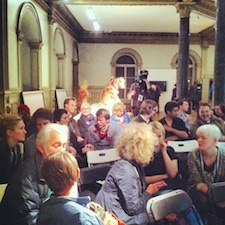 An evening session with drinks and performances in Stiftelsen 3,14 provided the brackets. 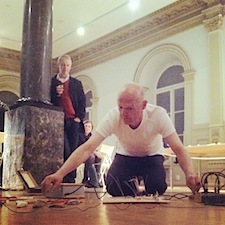 Norwegian artist Tore Honoré Bøe did a short performance, in which, crawling on his knees over Stiftelsen’s floor, he improvised with a number of what he calls acoustic laptops, amplified via contact microphones. Their description as ‘small wooden boxes containing a variety of small (re)sounding objects’ does them little justice. Bøe’s acoustic laptops are fascinating visual objects. They lay out intriguing micro-sonic geographies, that, however, are far richer and more interesting when silently contemplated for their relations and potential, than when brought to life as a run-of-the-mill set of ‘noise’ tools. Archival footnotes (of sounding/ ignominious and abject; sublime and silent/ for discontinuous listening and permanence in forgetting) was but the first in a long list of bracketed labelings that accompanied David Toop‘s very personal sound lecture, full of memories, associations, time, space, images and ghosts; full of echoes and full of silence. Sound needs sound to explain sound. Now turn off the lights. Ephemeral Sustainability. 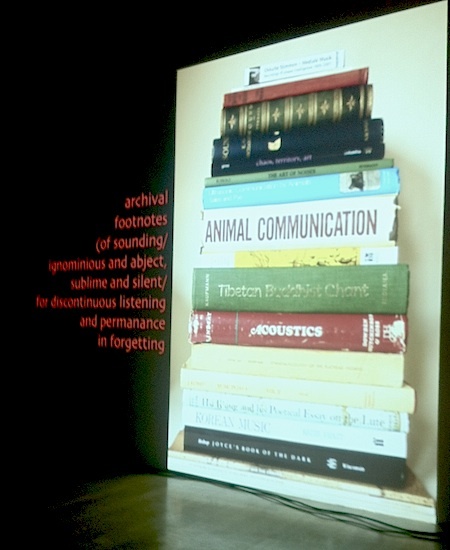 A conference about presenting, documenting, collecting and archiving sound based contemporary art, in Bergen, Norway. [Østre] Gruenrekorder soundscapes: Lasse-Marc Riek (de). [Østre] Presentations: Helga de la Motta-Haber (de), Aernoudt Jacobs (be), [[panel discussion 1]], SØS Gunver Ryberg (dk). [Gimle] Presentations: Signe Lidén (no), Kabir Carter (us), Edwin van der Heide (nl), Christina Kubisch (de), [[panel discussion 2]]. 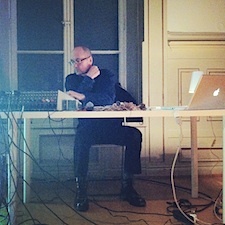 [Stiftelsen 3,14] Performances: Origami Boe (no), David Toop (uk). is sound art sustainable as an art form? You are currently reading Ephemeral Sustainability 1 – Sound Art at Resonance - European sound art network.